Bentley Blings Out Mulsanne With Silver And Gold Because Why Not? If you've ever looked at your Bentley and felt poor, this might be the car for you. There are two types of wealthy people, those that realize that money is no indication of actual value as a person and the ones that bank their entire sense of self-worth on the number of commas in their bank account. For those that fall into the latter of the two camps, Bentley has just the car for you, a full-size Mulsanne that wields the power of rare metals to add to its dominating presence. 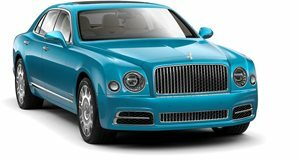 The name is a mouthful, Bentley Mulsanne Hallmark Series by Mulliner, but it helps add importance. Not like it needs any help in that department, silver and gold versions of the fifty-model series ensure that entrances rob as much attention as a Hindenburg landing. The Mulliner series is available across the entire model range, meaning both the Mulsanne Speed and Extended Wheelbase models can be had caked in silver or gold with hide lining in the storage compartments, painted veneer with metal inlay, and a matching fine line running the length of the body being colored to compliment the metal of choice. Topping off the package is a silver or gold “Flying B” mascot up at the front to cut the wind with the words “Commissioned” engraved on one side and “By Mulliner” on the other. The many hides of leather that cloak the interior gain a metallic shade with the front and rear seats using contrasting shades to keep the flashy theme going, as do the 21-inch polished wheels and distinct Mulliner (or an optional Serenity) grille brandishing an aristocratic grin up front. Accenting the two hide colors is silver or gold embroidery, piping, and stitching, which is used to stitch the diamond quilt on the rear seats and door panels. The Mulsanne Hallmark Series by Mulliner will be on display at the Geneva Motor Show along with the Bentayga Mulliner, turning the Bentley stand into a convention of multicolored eye-candy for visitors and window shoppers alike. Pricing hasn’t been announced, but if that’s a concern to you then move along to the Toyota booth because this car isn’t meant for you anyway.